GOCO Hospitality is a design-led wellness company that offers a wide range of services, from consulting and management to its own branded spas and retreats. On the brink of rapid expansion, the innovative firm teamed up with QUO to refresh their brand from top to bottom and launch an extensive new website. With a company culture that champions creative collaboration, GOCO Hospitality wanted to work with an agency that likewise believes in the power of teamwork. By forming a deep-rooted partnership that extended through all departments of both companies, QUO was able to fully embrace the brand’s ethos and work hand-in-hand through every step of the process toward a singular vision. Starting with a thorough strategic process that analysed the wellness company’s disparate target audiences – business partners and consumers in markets across the globe – QUO embraced GOCO Hospitality’s philosophy of creating balance and harmony in all things. A modern, new logo that emphasises symmetry and the holistic geometry of circles was created, along with a calming yet contemporary colour palette. The resulting visual identity creates a consistent and effective experience for the company’s myriad offerings. Unlike the many wellness companies that embellish their communications with flowery verbiage and ornate design, GOCO Hospitality stands out with its straightforward visual and verbal languages that seek to speak directly to customers as knowledgeable individuals. The content-rich website takes a user on a personal journey with its Zen-like design, intuitive navigation and highly refined, informative writing style. The recently launched company site is a complete expression of the brand’s vision, values, culture and products. 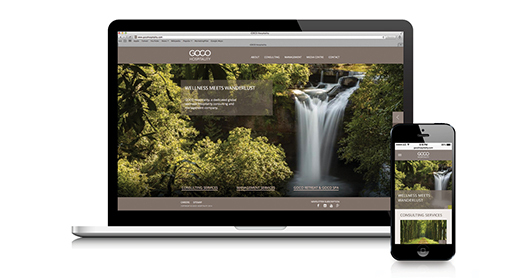 And the soon-to-be-launched consumer site will immerse guests in the authentic experiences to be found at GOCO spas and retreats. Together, the two sites work in seamless harmony, a perfect demonstration of the power of collaboration.